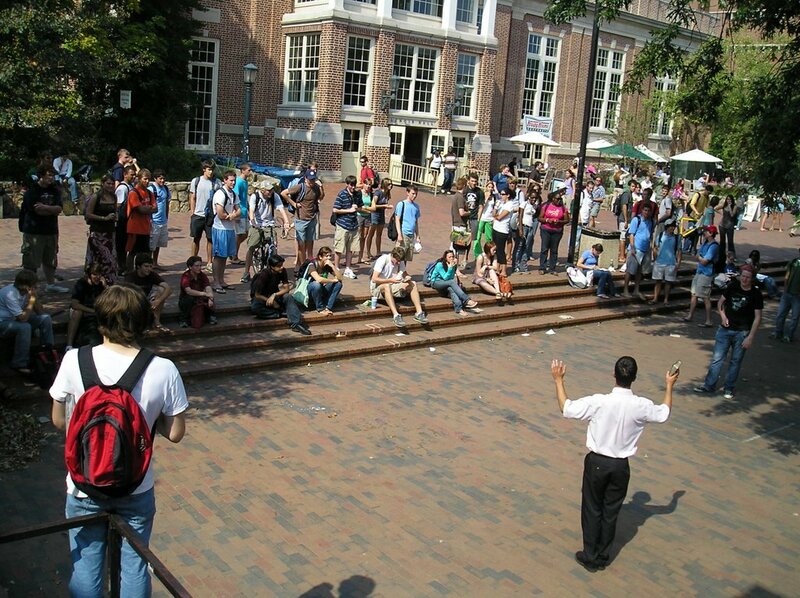 "The Pit", at the University of North Carolina Chapel Hill, is a famous campus preaching location in the country where we were able to speak at and declare the risen Lord Jesus Christ. The number of people at this campus was astounding; it is a small town all on it's own: complete with a diversity of people and places and lots of commotion. When we first arrived there was a Muslim demonstration taking place on a lawn near the center of campus and a folk rock band playing down in the Pit, a sort of indented stage in the midst of the busiest section of the university. As the Lord had it, not long after we arrived the band packed up and left the area, but another preacher was already prepared to jump up and preach. UNC gets frequented many times by campus preachers so the students are quite used to seeing them... but when the brother was finished speaking and Open Air Outreach got up to preach, we still rocked the Pit! This campus was a huge blessing to preach at. Praise God for His sovereign grace and unfailing love! May the gospel continue to go forth with great power as we saw it on this campus. God bless, dear friends. Thats some intense footage Elieazer... Its cool to actually see you do your thing. Keep it up! Your doing great!